Source: Thanks to the Publisher and author. 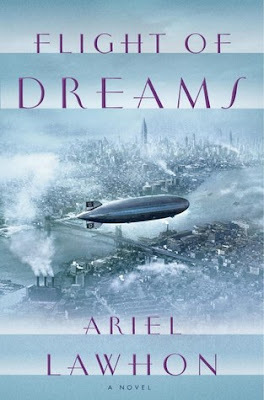 Before taking up Flight of Dreams by Ariel Lawhon, I knew very little about the Hindenburg disaster, I was just vaguely aware of it. As I read into this work of fiction I became fascinated by it. I even explored an internet site that Ariel mentions at the back of her book, and know I will go back to it. I am not that much interested in non-fiction, but sometimes a work of fiction sparks off a new awareness and quest for more. The names of the characters are those of the actual travellers on the Hindenburg. As Ariel points out the survivors said not much happened on the trip. However she picks up from there and writes a fascinating and page turning view of what might have been. How the Hindenburg became engulfed in flames is a mystery as yet unsolved. Even back in those times - 1937 - bomb threats were a worry and the crew were aware and cautious. Ariel Lawhon takes this event and these people and makes it accessible to me - the reader. As the story rotates among a number of characters, slowly I as the reader, build a picture of them. Their hopes, griefs, jealousies, and longings. I witness the crew and staff as they interact with kindness, blackmail, duty, subterfuge and revenge. I come to care for these characters and through them the actual people who travelled that fated time. This book has been well researched, I learned things about the airships that I did not know, all thanks to this research. What an amazing feat of technology. How amazing to have travelled in this way. As I said I knew very little about the Hindenburg before I started reading this novel. I had heard of its demise, but that is all. I had assumed there were no survivors. Amazingly there were. Many of the actual real survivors went on to live long lives. If you like historical fiction, fiction based on real events then this is for you. Or... perhaps you are like me - very vague about this event and time. Yes, most definitely this book is for you. Pat at Posting For Now has a fabulous review on Flight of Dreams and on it you will be able to link to a live radio recording and video of the disaster. I highly recommend visiting her post. Great review Kathryn. There are many aspects to this novel to like. Thanks for mentioning my post! Thanks for sharing...I have been eyeing this book, and enjoyed another by the author, so I'm sure I'll be reading it at some point. I also like books that increase my awareness of real events. My online book club through my library sent the first few chapters for this one out a few weeks ago, and I really liked what I read in those samples. I've been debating back and forth on it for a while. I know very little about the Hindenburg disaster. The author is coming to my local bookstore this month to sign and read, so I'm hoping to grab a copy, then. I am looking forward to this book. Glad to know you enjoyed it. I thoroughly enjoyed this book too. Ms. Lawhon did a fantastic job of making history come alive. I learned a lot about a part of history I only knew a little of. Me too Elizabeth, so glad I wasn't on it though - ordinary planes are bad enough! This sounds really good. So glad you enjoyed it. Thanks for sharing your thoughts.